Geopolitika - Another Russia – how much has left of it? In the middle of April the Russian OMON forces chased after the “dissenters” (nesoglasnye, more literally translated as “disagreeables”) with rubber sticks, among them were the elderly. Journalists have also experienced the „taste“ of sticks. Administration of the Kremlin justified actions of OMON as follows: they simply wanted to suppress the attempts of the radicals to destabilize situation in the country. Thus the world chess champion G.Kasparov, former prime minister M. Kasyanov and former advisor to V. Putin A. Ilarionov became „the radicals“. 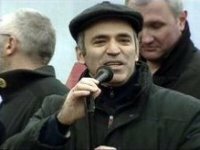 According to G. Kasparov, „street protests is the last measure provided for by the law to put pressure on the authorities of the country“. He said that V. Putin‘s opponents should organize their protests more effectively and attract more people to streets. The Western media was surprised by the diligence of OMON. Was that a sign of weakness or an obvious disregard of the international opinion? – this was the question in the review of Deutsche Welle with regard to motives of „passion“ of OMON. In order to calm down the situation, the Kremlin has taken ordinary rhetoric manipulations. ,,Militia has executed its duty“, said V. Putin‘s representative D. Peskov. However, he did admit to the TV channel Russia Today that OMON went beyond their commission. And this was not the first time when the nature of an „inconvenient“ event or phenomenon was hidden behind the rhetoric and information fuss. The recent events show that V. Putin and his comrade-in-arms try to convince the country to live according to the model, established in pursuance to the KGB ethics. It is a very simple model: You should be as everybody else. There will be no problems with YOU, since it is US who decide how you should live“. The Kremlin is dreaming about an effectively functioning state, however, its citizens must be „obedient“ and „predictable“ within the framework defined by the Kremlin. The ones disagreeing with the above scheme, are called radicals or marginals. They are simply „the others“. Russian authorities hate the above „eventualities“ and try to indoctrinate this intolerance to its society. The impact of the above “lessons” can already be seen in the Internet Blog discussions. Here beatings, arrests etc. of the „dissenters” and „the others“ are not only justified but even encouraged. There is lot of information on cases of intolerance and xenophobia in Russia, but hardly it has any influence on the Russian politicians and society. It seems that the current political elite of the country has already prepared the majority of the nation to any scenario. In view of the above, a natural question arises: does “Another Russia” still exist? As it turned out, it does... This year six members of the European Parliament representing Latvia, Estonia, Poland, England, France and Sweden, presented the Russian organization Memorial for the Nobel Peace Prize. Currently Memorial consists of 92 organizations, 80 of them are in Russia. The organization has been functioning for 20 years. According to historian and chairman of the board of Memorial A. Roginski, its members are involved in various activities – from the elaboration of the list of Stalin‘s victims to provision of assistance to conscripts injured in the Russian army; quite a lot of attention is given to the promotion of incorrupt historical memory. The recently announced Theses of the organization reveal that during the terror executed by the USSR in 1937-1938, more than 1,7 million people were arrested and 700 thousand of them were murdered. According to Memorial, the reasons of the majority of the current societal problems are in the sepulchral reality of „the grand terror“. It states that consolidation of society and national rebirth in Russia are simply impossible without an open, although very painful, evaluation of this tragic experience. The Central and Eastern Europeans do know how depressive shadows of the historical memory are. However, it is hard to imagine, how nearly 70 per cent of the Russian citizens considering themselves as V. Putin‘s supporters, could manage to realize and evaluate their history of 20th century. The Russian authorities have suggested to the Russian society (which has recently gained more confidence) to accept a „simplified“, evaluation of the present time and history, i.e. the second rebirth. Members of Memorial comprise only a small part of „Another Russia”. They are involved in the risky (in view of the current political situation of the country) and complex activity for protection of human rights. Similarly as the participants of „the campaign of dissenters” they do their best so as to prevent Russia from authoritarianism.